Qwilr helps your brand to remain consistent across all your documents. You can set up your brand colors, fonts, and domain details in one location and have them applied consistently across all Qwilr Pages produced in the account. Set once and forget. We know that sometimes you might want to make exceptions to your brand rules. That's why we created Custom Styles. So you can modify the style of individual blocks or set styles for just one Qwilr Page. Note: These settings are only available to account admins. 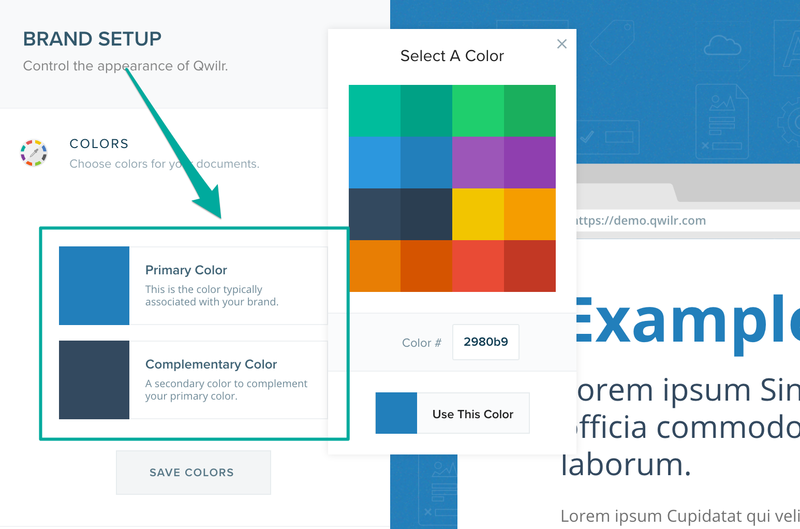 Colors are selected at the account level and apply to all projects within your account. You can select a "Primary Color" and a "Complementary Color". To select these colors, head to the Settings menu and choose Set up Brand. On the page that loads click on either "Primary Color" or "Complementary Color". You can select colors from our pre-populated palette or enter a hex color code. Set your Complementary Color to a neutral black or grey. 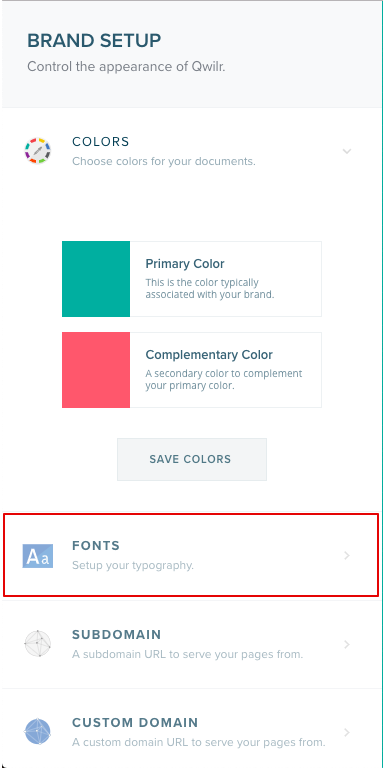 Fonts are selected at the account level, and apply to all projects within your account. Different fonts can be selected for Heading (H1), Subheading (H2) and Body text. To select these fonts, head to Settings > Setup Brand then select Fonts. Select a Google font (one of 700+ fonts). Select a Typekit font (once you've added your Typekit Font-Kit ID). Select a custom font (one you've uploaded). Typekit fonts can be used on the Business plan and above. Custom fonts are available on our Enterprise plan. How do I start using a Google font? Head to Settings > Fonts in your account. Select one of the text classes (Heading, Subheading, or Body text); select "Google Fonts"; select your favorite font. Note that you can search through, and filter, the (very long!) list of Google fonts. By default, your Qwilr Pages your pages are served at pages.qwilr.com. But if you're on our Business or Enterprise plans you'll be able to upgrade that to a domain that reflects your company and brand.